Dianara pump.io client v0.9 is out!! Hello there! About a month after 0.8 was released, Dianara 0.9 is out! As you can see, there’s now a Symbols sub-menu, with a few semi-standard symbols that might be useful to have. And it will remember the folder you used in your previous upload during the current session, so you don’t have to navigate to the same folder over and over again when posting several images. The tray icon will show you how many unread messages you have. The catch is that after each timeline reload, previously unread messages are marked as read, but you know… next version! Image uploads with title and description. New posts are marked as unread until clicked or timeline is updated again, and the unread messages count is shown in tray icon. Publisher or commenter are not cleared or hidden until posting is confirmed, so you don’t lose your post in case of network/server error. Some information about posting state is shown. Added a “Symbols” submenu under the “Formatting” menu in the composer. Lowered QJSON requirement to 0.7.x, which means users of Debian Wheezy, Trisquel 6 and other distributions which still have QJSON 0.7.x can build Dianara now. 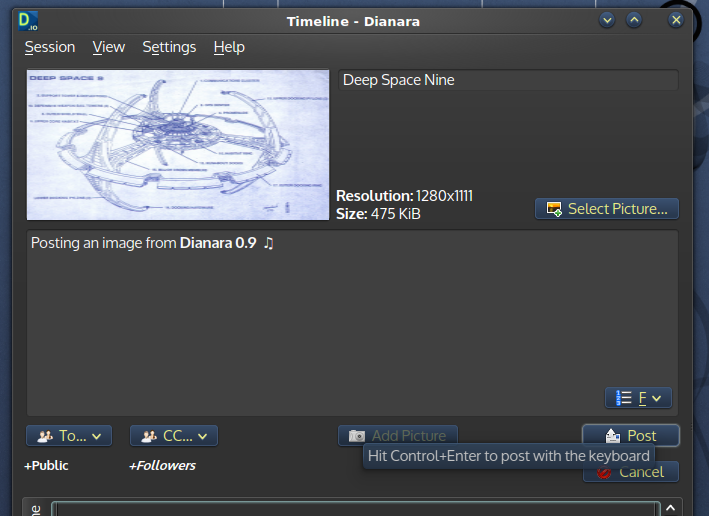 Dianara 0.9 is available in English, Catalan and Spanish languages. A Polish translation is in the works. 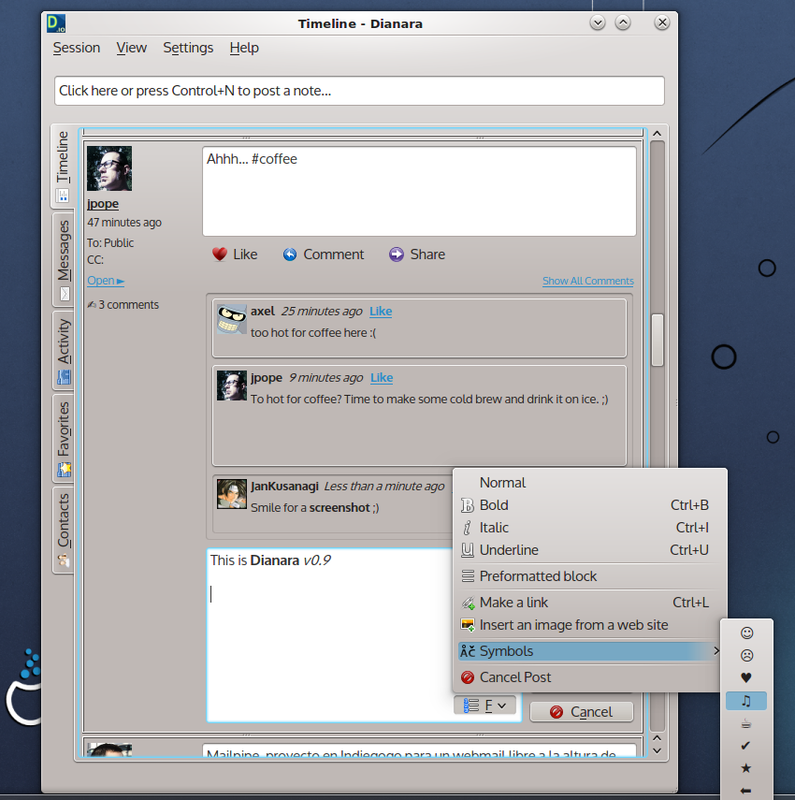 There are Dianara packages for openSUSE available. You can also find it in Archlinux’s AUR and Chakra’s CCR. There is a Gentoo ebuild, and a Debian package currently waiting in Debian’s FTPmaster NEW queue. This entry was posted on Monday, August 5th, 2013 at 5:20 PM and is filed under Dianara, GNU/Linux, Projects, Pump.io, Qt. You can follow any responses to this entry through the RSS 2.0 feed. You can leave a response, or trackback from your own site. 4 Responses to Dianara pump.io client v0.9 is out!! “New posts are marked as unread until clicked or timeline is updated again” – I’m not sure if it’s so good to mark as read after timeline reload. Imagine a situation when you’re reading posts, comment on one of them (so the timeline reloads) and you no longer know which are unread. It just happens that, the way the pagination of the timelines is handled, it’s simpler this way. One of the things I still need to do, is ‘proper’ pagination. When that’s done, the unread messages will be unread ‘forever’ (or maybe until you exit the application, with an option about it). BTW, commenting on a post doesn’t make the timeline reload. If this has happened to you, it was probably coincidence that the auto-update triggered right after you sent the comment, just because it was time.